You can't understand the chaos of Brexit without understanding the fundamentals of the European Union. 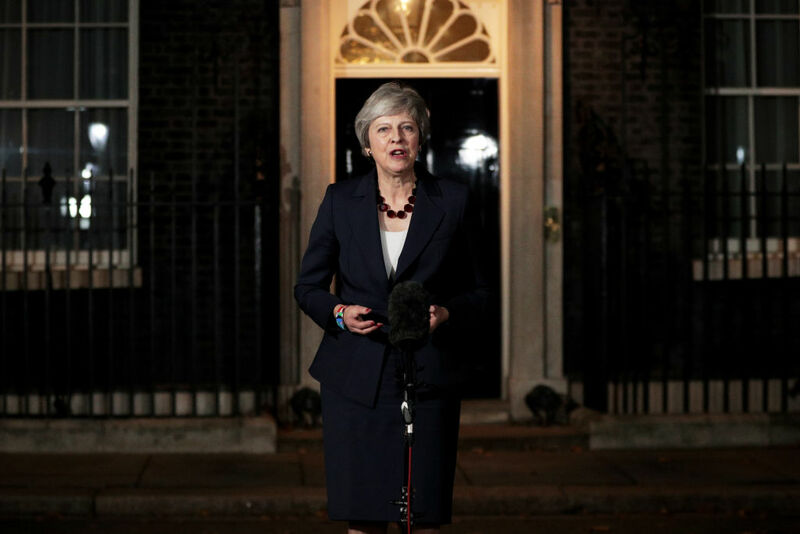 On November 14, after months of negotiations, Britain’s Conservative prime minister, Theresa May, unveiled her draft Brexit deal to leave the European Union. Not long after, the European Union’s twenty-seven member states approved the major details in Brussels. But the deal is so obviously a bad one that it’s elicited howls of protest from every political corner, including from her own party. While May managed to secure Cabinet approval, two top cabinet ministers quit the next day, including her Brexit minister. The near-unanimous opposition has raised the possibility of a “no-deal” Brexit upon the deadline of March 29, 2019. The chaos has opened up all kinds of potential scenarios: a second referendum, a general election, a second vote on May’s deal. Yet behind all the drama, has anything fundamentally changed in British politics? To find out, Politics Theory Other host Alex Doherty spoke to Jacobin contributor Richard Seymour. They discussed the consequences of a no-deal Brexit, where the forces of the Left stand, the nature of the European Union, and the best scenario for carrying out Jeremy Corbyn’s program. As things stand at the moment, it looks likely that Theresa May’s Brexit deal will be voted down in parliament. It’s been widely suggested that rather than a second referendum or a general election, the more plausible scenario is that the deal will be voted through in a second attempt. It would happen in the context of a run on the pound and a Project Fear–style campaign, and that the threat of a no-deal Brexit would be used to discipline MPs. However, [Conservative MP] Amber Rudd suggested that the no-deal threat is a pretty empty one, which might make it harder to corral MPs into voting with the government. What do you think is the most likely outcome? My intuition is that we’ll get a version of May’s deal. If it’s negotiated by a Labour government, it might be a slightly better version. If it’s negotiated by a harder Brexiteer than May, it might be a worse version. But that would depend where the center of political gravity lies. There are a lot of people saying that a no deal is the only thing that there’s a majority for in the House of Commons. The problem is, that rests on the idea that Labour MPs will vote loyally. I would be surprised if there wasn’t a significant faction of Labour MPs willing to break ranks on this. They’re already setting up their excuses, their arguments, their justifications, and of course the main justification is: if they don’t vote for the government’s deal then it will be no deal and that would be such a disaster. The government has considerable leverage, not with Europe but with Westminster, and it could offer a lot of pork to various constituencies. It can offer a lot of favors. It can twist a lot of arms. And if it comes to a no-deal situation, many of the senior civil service would resign rather than try to implement something like that. There’s more discussion now about the possibility of a second referendum. You’ve written that while you’re sympathetic to the people in the People’s Vote campaign, in your view, the European Union is not, cannot be, will never be, what its left-of-center partisans want it to be. Why do you reject the possibility that the European Union could be reformed in a progressive direction? The obvious question I would like to put to left Remainers is, what of the treaties of the European Union do you agree with? The answer would not be very extensive. Someone might say, “Well, the Schengen zone I agree with,” but even there you have to qualify it by saying, “But it’s a pity that it’s tied to Fortress Europe.” Someone might say they’re in favor of the social chapter, but they would also have to say that it’s a pity that the social chapter comes with neoliberal competition state aid law. And so on. If you look at the treaties they’re overwhelmingly restrictive in terms of what national governments can do with their budgets, with their industrial strategy. They’re not really able to have an industrial strategy. They’re required to maintain balanced budgets. That’s austerity budgets for most of Europe. They used debt as an instrument with which to pummel Greece, to force Greece into privatizing most of its existing public sector industries, selling them off at fire sale prices, cutting pensions. This is the standard EU agenda. Now, can the European Union be reformed in a progressive direction? I don’t foreclose the possibility that some serious mass political struggle could result in a reformed European Union. I don’t think it would become a progressive institution, but it could become less worse than it is. But we have to think seriously about the scale of disruption and rupture that would be required to make it happen. I was just reading today’s news about the Italian government. The Italian government is locked in a battle with the European Commission over its budget. Now, the Italian government is pretty far right, but it has a populist anti-austerity budget. It’s mainly anti-austerity for the rich and the middle class, but it has some sops to the poor as well. And it breaches the balanced budget rules of the European Union. The deal is when you draw up your national budget on an annual basis, you take it to the European Council and they decide whether it’s compatible with your treaty obligations; with your obligation to manage your debt, whether wages are too high, if they risk driving up inflation. That’s a key issue at the heart of the European Union. They can decide whether or not you’re spending too much. And if you are found to be pursuing an untenable budget within EU rules, you will be told you have to go away and change this and then come back and we’ll approve it. If you don’t do that, then you have what has happened to the Italian government. They have been referred by the European Commission to what’s known as the “excessive deficit procedure.” That’s going to result in a series of steep and deepening fines on a regular basis. Now, they’re not relying just on the fines. If it was just about the fines, the Italian government probably wouldn’t have much to worry about. It’s the way in which political pressure intersects with financial pressure. In other words, the European Commission would be relying upon the financial markets to punish Italy. And the Italian government is playing a bit of a game: it’s trying to avoid a speculative attack on Italy at the same time it’s trying to weaken the European Commission’s position by facing it down on its budget. It’s possible that defiance of this type could result in a weakening of the European Commission’s position. But let’s just be realistic about what we’re up against. The European Commission has all the power here. It is an unelected civil service bureaucracy, and it runs things on the basis of a rule system, a code devised for Europe’s rich, for Europe’s investors, for Europe’s corporations, and it’s completely aloof from democratic decision-making. So when [European Commission president Jean-Claude] Juncker said during the Greek crisis that there can be no democratic decisions against the treaties as far as he was concerned, he wasn’t saying anything particularly controversial. This is a condition of being a member. In Greece you had a series of emergency governments, a massive political crisis, near-insurrection among organized workers. Governments were falling one after the other. Then you have a radical left government elected by a big margin, and they achieve victory for a referendum against the European Union’s settlement. And the European Union still isn’t moved by this. That tells you something about how entrenched their resilience is in the face of democratic pressures. That’s the problem with the European Union: despite what some silly Remainers say, it is even less democratic than national states. It is probably more insulated from the popular world than even the House of Commons. That’s the reality we’re up against. It’s going to be a hard-fought struggle. The other side of that is it would also up the stakes as far as the European Union and the European Commission are concerned. But yes, absolutely right. Get Mélenchon in, get Corbyn in, have governments committed to public ownership, extensive subsidies, and stimulus spending. All of that would have an effect in changing the balance of class forces condensed within the European Union. Because ultimately, while the European Union has a logic of its own, it remains predicated upon the powers of its national states. So what happens within national states will make a huge difference to the shape and structure of the European Union, particularly if you get change in the core states such as France and United Kingdom. But the thing is, we have already voted to leave. A majority — a slender majority, but a majority nonetheless — voted to leave. I don’t exclude the possibility of a second referendum. The problem is that, first of all, it may not win, and second of all, it may win. If it doesn’t win for a second time, then you strengthen the Brexit right. They’ll say, “We managed to see off a coalition of the Left and the politically correct liberals for a second time.” And the Left will have been associated with a campaign run by the hard neoliberal center because they haven’t learned any lessons. They haven’t changed their strategy or messaging. They’re still doing the same bloody thing. Then the other side is what happens if it wins. If it does win it may win with a fairly slim majority, because the fundamental dynamics of the UK population and its opinions on Brexit haven’t changed that much. It would entail Britain applying to reenter the European Union with its tail between its legs. I’m not particularly partisan on Britain or the United Kingdom, but I am a partisan of the idea that other things are possible. That there are alternatives to being members of this or that neoliberal institution, and that the gesture of returning to membership in the European Union, terrified out of our wits by the prospect of no deal, would be a fundamentally conservative one. It would once again reaffirm the idea that there is no alternative. We can’t come up with anything better. And that may end up being the case. But then, if that is the case, we have to recognize exactly the situation that we’re in. We’re in such a state of weakness that we ended up being pushed back into a series of neoliberal treaties. For what? For most of the Left, it’s so that we can keep free movement (for white Europeans, largely). I don’t see what in this set of institutions is worth throwing aside all serious rigor and analysis for. Another possible consequence of a second referendum, if there’s a narrow Remain victory, is that it might boost the far right. How concerned do you think people should be about that, of the prospects of civil disorder and anti-migrant violence and so on? If there was a massive gain for the Left to be had in having another referendum, then I would be in favor of risking the strengthening of the far right. Because the gains to the Left would ensure that we’d be able to strengthen our position and cope with the forward thrust of the far right. We would have more defensive powers in the face of it. The problem is that the left Remain crowd wants the European Union to be something that it isn’t. They want the European Union to be a net progressive institution, and it just isn’t that. They may claim that no matter how neoliberal the European Union is, the British state is not better. Well, that’s absolutely true. And if the alternative to the European Union is Singapore-style capitalism or Hong Kong capitalism, obviously that’s not an improvement. But we are in politics not to choose between options that other people have created for us. We have a left now, we have forces, we have hundreds of thousands of people passively supporting. We have tens of thousands of active people in the Left. We’ve got a labor movement. There are things that we could do to shape the situation. If your answer in a situation like this is, “We’ll just accept a pair of options that other people have put on the table rather than fight for something that we might prefer,” then that’s a collapse in political initiative and imagination. It’s the kind of logic that has tended to result in the Left following the center into its demise. We’ve seen this again and again, that kind of defensive strategy. There’s almost no strategic thinking about the European Union. There is instead a great deal of emotive, moral, and almost identitarian thinking about the European Union. The extent to which a large number of people on the Left identify with the European Union is bewildering and rather frightening and sinister. Do you think that flows from a sort of political pessimism derived from a long period of left defeats, or do you think it’s more to do with the class position of some of the hardline Remainers? I think, for what it’s worth, that Europeanism is another form of nationalism. I don’t think it’s better than British nationalism. It’s different and has different characteristics, but it is nationalism. Really, it’s a combination of the things that you mentioned. Because if you think about it, had the Left been more of a significant factor in British politics for a bit longer, there would have been in 2016 a tradition of critical analysis of the European Union. There would have been a more serious public discussion of the merits and deficits of belonging to the European Union and its treaties. And we would not have had a debate structured between the hard nationalist right and the neoliberal right. That pessimism was structured within a realistic appraisal of the relation of forces as they existed in 2016. In 2016, the Left was weak. Corbynism was very tentative. It looked like it could collapse at any moment, and the Brexit right had been growing in strength for some time. So there’s pessimism that is founded on a realistic appraisal of the balance of political forces, class forces. There’s also a degree of pessimism that comes from a certain focus on the politics of race because if you do have that focus, you can’t have a naïve view of the working class. And that can be taken to the extent of being quite pessimistic about the capacity of white workers to do anything progressive. You mentioned class position. That’s part of it. There are people based in parts of the country that have strongly benefited from being part of an economy tied to the economies of Central Europe. And those tend to be people in professions linked to the centers of communicative, financial, political, and cultural power. That’s linked to the regional aspect. It doesn’t map straightforwardly North-South, but if you are living in more provincial, more cut-off areas, you were more likely to have experienced long-term decline in your life chances, and to have voted Brexit. However I don’t think the answer to the bad arguments of the Remain camp is to berate them for being middle class or for being pessimistic. First of all, neither of them is a crime in particular, and pessimism is not necessarily wrong. It depends on how well-founded it is. All I would say is that we are in a different situation now than we were when the Brexit vote happened. There are, presented before us, a different constellation of forces. I’m not in favor of just bullishly declaring that we can do whatever we want with Brexit, without regard to the necessary political coalitions and the strategies that would be needed to realize that kind of agenda. And that’s one of the reasons why I’m not arguing vocally for a hard Lexit. In order to make that work for the Left, it would require the mobilization of political forces and coalitions that currently don’t exist. One would be taking a gamble that one could summon those forces into existence by mounting a challenge against the European Union. At the moment it’s not a question of whether of you’re pessimistic or optimistic. It’s a question of, in what does your pessimism consist? Where do you think the really bad option is? Where do you think the least worst option is? The critique of the European Union is often couched in terms of the European Union overriding national sovereignty. But in a recent blog post, you argued that this is a misconception; that European states and business elites have supported the project precisely because it enhances the sovereignty of the upper echelons of government. That claim will seem pretty counterintuitive to a lot of people on both sides of the debate. The reality is that the member states continue to have a strong say in the formation of the policies that they’re ruled by. But it’s not the elected governments of the member states that are decisive. Rather, it’s the executive — in Britain’s case the crown and parliament and the higher reaches of the civil service — who are decisive. If a member state wants to — and of course this is what we’re debating so feverishly now — it can leave, it can break from those treaties, so it’s not as if it’s under occupation. It’s not as if the state has given up the sovereign legal form as it were. And they continue to exercise their sovereignty in continuously affirming their membership of this organization. We just have to recognize that there is a difference between a democratic polis — the electorate — and the higher reaches of the state apparatus. In other words, we have to apply a bit of class analysis. What is the difference between that polis and the sorts of civil servants that are negotiating Brexit? Take Olly Robbins, who is a classic Westminster mandarin, who came up through the treasury and then the security establishment. He’s over there negotiating the Brexit deal. And of course, what does he come back with? Does he come back with a series of recommendations that would benefit the middle-class right that is very popular within the Conservative Party? Absolutely not. He comes back with a Brexit deal that resembles that which would be demanded by the largest factions of capital in the United Kingdom. He was thinking in terms of what would benefit the largest blocs of capital. I don’t think it’s a matter of conspiracy. It’s a matter of that’s what he would regard as being in the national interest. Say a nation’s civil service wanted to keep its elected governments under control, stop them from overspending, stop them from nationalizing industries. In the past you would have had Antony Part, who was the personal and private secretary to Tony Benn, approach him when has just been elected as part of a Labour government, with a mandate to restructure industry, bring about forms of workers’ control, nationalize some industries. And Antony Part comes to him and says, “I trust that you have no intention, minister, of implementing your manifesto commitment.” Of course, Tony Benn said, “I absolutely do. Why would you ask that question?” There resulted a degree of conflict between them, with Antony Part — as part of a wider civil service faction linked to the right wing of the Labour Party — trying to restrain Benn and prevent him from implementing his agenda, and by and large succeeding. There’s part of the answer to your question. The other part of the answer has to do with what I said earlier about defiance. Because, of course, there are treaties, there are rules, but the government is still sovereign. The government still decides what its budget is. So, a government passes the budget that it wants to pass, and decides whether it wants to take the consequences in terms of fines, the potential for financial backlash, a speculative attack, etc. But it would face a version of that, any government would, in trying to implement a non-orthodox, non-fiscally austerian agenda, whether inside the European Union or not. The European Union formalizes and entrenches forms of discipline that are already potentially there, within the national state and within its relationships to business. The European Union just gives them that much more strength, that much more cohesion, that much more power. And it strengthens, as I said, the higher reaches of each national state. This comes down to: how do you theorize the European Union? Do you think it is an autonomous political entity, or do you think it still derives its power and authority from national states? I think the latter. As such, I tend to think that sovereignty is not being given up, but rather that it’s being pooled in a different kind of institutional format, one that strengthens the higher reaches of the state. Republished from Politics Theory Other . Alex Doherty is the host of Politics Theory Other .